Will Palestine Retain Its Natural Gas Fields? For the moment, all is quiet on the Israeli-Palestinian peace front. Is it “too quiet”, as they once asked in movie westerns? That depends entirely on what kind of peace is being discussed. Does danger lurk, or does a just peace lie ahead? U.S. Secretary of State John Kerry could be working furiously behind the scenes for a just peace. If so, he would be demanding that the natural gas fields off the Gaza coast remain under Palestinian control. 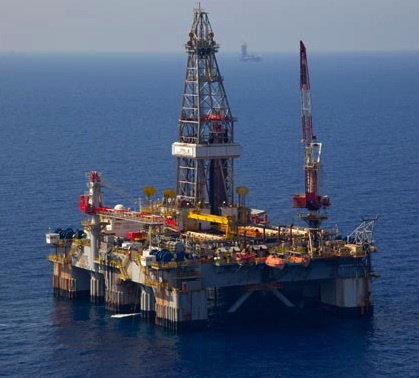 Gaza Marine gas field is located 30km off the coast of the Gaza Strip, in the eastern Mediterranean Sea. It lies at a water depth of 603m. The development of the Gaza field has been on hold for several years due to disputes between Israel and the Palestinians. Earlier this week Israel’s Ministry of National Infrastructure authorized Noble Energy, a crude oil and gas exploration U.S. based company based in New York, to begin developing a natural gas field off the Gaza Strip coastline, the Palestine News Network reported. . . .
British Gas has already established two offshore natural gas wells, Gaza Marine 1 and Gaza Marine 2. (above) According to British Gas, the natural reservoir off Gaza is estimated to contain 1.5 trillion cubic meters of natural gas with an estimated net worth of approximately $4 billion. Two years later, in the quietness of the peace talks, the U.S. is in a position to cancel Israel’s illegal seizure by affirming that Palestine’s natural gas fields belong to Palestine. In addition to enabling Palestine’s economic potential through its own natural resources, a just peace would end Israel’s illegal occupation of Palestine. The end of the occupation would remove Israel’s control over Palestine’s borders and give Palestine responsibility for its own internal security. A just peace would deliver an international airport that is a necessity for a new Palestine. A seaport large enough to handle Palestinian tourism and economic traffic will have to be developed. A just peace would provide Palestine with access to the profitable tourism trade and the rich mineral deposits on the shore of the Dead Sea. That shore line area is shared by Israel and Palestine, according to the 1967 Green Line border. On the other hand, and this is the bad news, the code of silence that currently hovers over the peace talks may also be harboring a darker vision of Palestine’s future. Secretary Kerry, acting as something less than an “honest broker”, could be devising a token economic and freedom bucket list of promises that would be nothing less than a “carthaginian peace” imposed by the U.S. and Israel on Palestine, a “peace” which conquering armies impose on a defeated population. The term, “carthaginian peace” entered history after Rome defeated Carthage in the Punic Wars, fought from 254 BC to 146 BC. a series of three wars fought between Rome and Carthage from 264 BC to 146 BC. At the time, they were probably the largest wars that had ever taken place. The term Punic comes from the Latin word Punicus (or Poenicus), meaning “Carthaginian”, with reference to the Carthaginians’ Phoenician ancestry. The main cause of the Punic Wars was the conflict of interests between the existing Carthaginian Empire and the expanding Roman Republic. The term, carthaginian peace, was most recently used to describe the peace terms the U.S. and its Allies imposed on Germany in the Treaty of Versailles, at the conclusion of World War I. Ironically, it was this unjust and vengeful carthaginian peace forced upon a defeated Germany that contributed to the rise of Hitler and the Holocaust in which six million Jews died. If the U.S and Israel succeed in forcing Palestine to endure a carthaginian peace, it will be a peace sold to the world as necessary to protect the “security needs” of Israel, which will, on cue, claim that the peace agreement is needed to prevent the annihilation of the Jewish people, a trope that has lived well past its expiration date. Rashid Khalidi, in Brokers of Deceit, points out that this “trope of imminent destruction effectively constitutes a sort of free pass for Israel that covers a multitude of sins and allows it to get away with behavior that otherwise would be considered outrageous and impermissible”. Far from being defenseless, Israel has for most of its existence struck fear into its weak, relatively poorly armed, underdeveloped, and disorganized neighbors. None of these neighbors, without exception, singly or united, are particularly dreaded by Israel’s tough and seasoned generals, however much fearmongering Israeli, and American, politicians may engage in. (p. 75). If Kerry and his team are to design a just peace, rather than a carthaginian peace, Israel would have to give up its “free pass” for its multitude of sins and learn to live like the good neighbor it claims it wants to be. As long as the code of silence continues around the peace talks we may only speculate: Will the U.S. rid itself of its Zionist propaganda shackles and demand a just peace for Israel and Palestine? Or is the U.S. busy preparing a glossy cover for a carthaginian peace which would brutalize Palestine and assure no peace for decades to come. A carthaginian peace would be a disaster for Palestine and Israel. A just peace is the only way to bring peace to the entire region. The picture at top is from offshore technology.com. This entry was posted in John Kerry, Middle East Politics. Bookmark the permalink. 8 Responses to Will Palestine Retain Its Natural Gas Fields? I had forgotten that “Punic” referred to “Phoenician.” Carthage was a colony of Phoenicians from Tyre in Lebanon. Phoenicia refers to the “purple-sellers” or the dye for which Phoenicia was famous. I am transported back to Latin class in the 8th grade by your use of “carthaginian peace,” Jim! An inspired way to connect the expected outcome of the peace talks to the “trope of imminent destruction” Rashid refers to…thanks! Many thanks for your outstanding article, Jim. Talk about Gaza’s significant gas fields reminds one of Israel’s tyrannical limits on how far Gaza fishermen can venture from its shores to fish. I wonder if there is any connection here. I am sure that Israel is not too concerned about Palestinians’ ability to fish. Perhaps, Israel is preparing to start work on occupied Gaza fields to steal as much as possible, before a peace process is concluded, if ever. Incidentally, your “Carthaginian” analogy is even closer than most of us think. Let’s remember that the “Canaanites-Phoenicians” were the original inhabitants of Palestine, Lebanon, and Syria. They were called Canaanites in Palestine and as some of their tribes moved North to Lebanon/Syria, they were named “Phoenicians”. But, they are identical people. At a later stage, Phoenicians primarily from Tyre and Sidon area (in today’s South Lebanon) established Carthage in what is currently Tunisia. Before President Obama was elected, I used to think that this will be the Litmus Test, the very last straw, as to how far the US can get away (from the Zionist Lobby) in establishing some minimal justice in the Holy Land. With Obama well into his 2nd term, it is clear to me that the answer is close to ZERO. So, realizing that I should know better, I will still watch what Mr. John Kerry is “allowed” to bring forth to the table. After all, do not believe for a minute that he has relinquished any thoughts about running for President, some day. Meantime, who knows what he has promised to do for the Lobby? Palestinian civil society remains steadfast in its demands for a just peace, not a jot or tittle less. In 1948 Marty Buber said it perfectly” Palestine: one land for two peoples, living in peace and harmony with each other.” Israeli governments provided generous incentives to more than 560,000 illegal settlers to squat on Palestinian land and steal Palestinian water and mineral resources. PM Netanyahu does not expect to be in the illegal settler re-settlement business! The Palestinians own not just the gas fields off Gaza. They own additional tens of miles of Mediterranean shoreline that’s been Israeli-occupied since the 1949 Armistice Line was put into place. Israel’s legitimate borders are those assigned to it in 1947 by the UN. Nobody on the Palestinian side has had authority to negotiate away the land beyond those borders, land that Israel took by force. It remains Palestinian land and the gas fields off that coast belong to Palestine. A future International Court will likely have to determine reparations due the Palestinians for gas taken by Israel in those areas. Indeed Jim we so appreciate your fullsome writings with inspirational, historical insight and perspective. Now that the U.S. has cut foreign aid to Egypt what would it take for the U.S. to cut foreign aid to Israel? Thank you for this. I find this article a year after you wrote it, and how true it rings. I wrote an article this morning about the school shelling in Gaza, and tonight I was researching Palestinian oil.. Google led me to you. It is hard to find people that write about that.